You deleted a file yesterday; now you really need it back. Your Windows recycle bin is empty — what now? Your next-best option is the Restore Previous Versions tool — a truly great, automatic data-protection feature buried in Win7. I say “buried” advisedly; most people have never even heard of it. You’ve heard of it, of course — you read Windows Secrets! But I’ll still bet you rarely, if ever, use it. And if you have used it, I’ll bet your initial explorations were probably like mine — a click here, a poke there, some head-scratching, and then mostly ignoring it. But it’s a mistake to ignore or underuse this feature, because it really is a hidden gem. What is Restore Previous Versions, exactly? Introduced in Vista and now present in all editions of Windows 7, previous versions are local backups of every data file and folder that changes on your system. The backups are created automatically and are instantly accessible. Previous versions do for your standard documents (text files, spreadsheets, photos, whatever) what Windows System Restore does for system files. The function that creates previous versions is enabled by default and is probably working right now on your PC, whether you’ve ever used the previous-versions feature or not. In the next section, I’ll walk you through the Restore previous versions command, using my PC as an example. Follow along on yours — it’s quite safe; no files will be changed unless you specifically command it — and it’ll only take a few minutes. If you don’t know about Restore previous versions — and maybe even if you think you do know — you just might find it eye-opening. Because this backup system stores only files that have changed, the best place to see it in action is in a folder that you use a lot — one where you frequently alter the folder’s contents. The My Documents folder is usually a good example, so that’s what I’ll use in this demo. To start, open Windows Explorer, right-click My Documents, and select Restore previous versions, as shown in Figure 1. Figure 1. Restore previous versions is enabled by default in all editions of Win7. It lets you recover recently lost or altered documents, spreadsheets, pictures, etc. 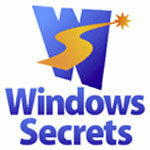 Windows Secrets fred langa, Microsoft, Windows 7, Windows OS, windows secrets. permalink. Ask Leo: Is it safe to run as admin now that Windows 7 has UAC? Yes it’s very well hidden on Win7 which is really annoying. I note that on my installation (which is right up to date) right clicking on My Docs DOES NOT OFFER a restore option. So problem No 1: Why is this so & why do you not know this? Makes it hard to have confidence in any other instructions. And as I recall this “Restore to an earlier time” was an easily accessible feature on XP. Again you have it wrong for an OS that is still about 50% of general useage. My system picked up a Trojan virus and Mcaffee camr along and said it delted a Trojan. When I restarted my computer it shows only 1 item on the desktop and all files on my external drive gone and many on the C drive as well. I found sytem restore and was able to run it and it brought everything back perfectly.